Kat and Karl : Kim and Sean and the boys in India! Kim and Sean and the boys in India! 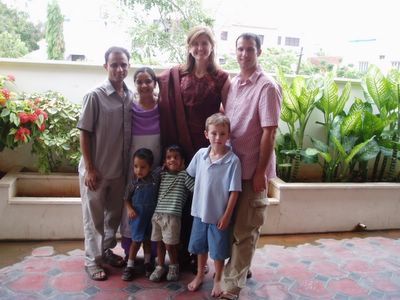 Kim and Sean and Fisher and Simeon and friends in India! Below is a quick email from kim that she sent the family. you don't have to read it all but i thought it was interesting! An Indian friend showed us a neighborhood pool yesterday. She looked back at me in the car and said “Why are you interested in swimming when it is the COLD season?” I am in the back of the car sticky from sweat and I turn to my U.S. mommy friend and say “How can THIS be the COLD season when we are so HOT!” We both had a nice laugh over that one. We recently had some cultural training from an Indian friend. Anyone out there remember Roshan? We met his wife, Esther, and 3 yr. old son, Ratchit (seen in above picture). One of the things he emphasized with us was to never point your foot at someone. Now most people don’t use their foot to point to someone I realize, but I am talking about never crossing your legs and have your foot out, angled toward someone. That is kinda hard! Feet are very offensive here. We are to never put our feet on furniture or have our feet touch someone. All that said, one night while eating out at a restaurant, I glanced over at Simeon to find him sitting with one foot on the edge of his chair and one leg dangling out in the aisle near people. Ha. We are learning all kinds of new things as a family! The main mode of transportation around here is by auto rickshaw. The best way to describe it is to try to picture a 3 wheeled golf-cart painted yellow with a black top smashed down a little bit. It usually holds 3 people, but when Roshan and his family were here, we had 4 adults and 3 kids in one. It was pretty fun and the kids love going places in them. On another occasion we had a “fancy” rickshaw with lots of decorations hanging down and music blaring!! So there I was packed into this auto rickshaw riding down the crowded streets of India with an Indian version of Michael Jackson’s “Beat It” blasting from tiny speakers. Memorable moment! We are staying in a “bed and dinner” type place that is really nice. As you might guess, the dinners served are all Indian. I am happy to say that last night I felt full for the first time eating Indian food. Biriyani is an Indian dish that Hyderabad is well-known for. If you are feeling adventurous, why don’t you try it at your favorite local Indian restaurant? Simeon loves eating with his hands, and I fear that it might be a hard habit to break when we return to the U.S. Fisher is holding his own in eating—peanut butter is carrying us through some of the more difficult meals. There are two types of women in India—the traditional woman and the college student. The clothing that they wear is very different. So as not to offend the traditional women in India, we now wear salwaar kameez outfits--Big baggy pants and a very long tunic. They are fun to wear. I even had mine TAILOR MADE and the pants are still too SHORT. I think the Indian guy who made it must have thought, “surely she is not this tall”. Yes, I think I am the tallest woman here in Hyderabad--My claim to fame! On the flip side, most female college students are very western and trendy. They like to wear tight jeans and western type tops. A college student was over recently and she giggled when we pulled out some salwaars. Apparently our initial choices weren’t the most stylish. I’ll close with this fun fact: Did you know that if you say “freaking out” among students here that you are NOT referring to what I was doing the night before we left for India, but instead referring to just hanging out with friends. I miss “freaking out” with you! That was fun to read and educational. Thanks for sharing.